On the fourth day of the ride we woke up at 7:30 am with the knowledge that the hard riding was over and we could ride slow and easy from here onwards. Tso Kar was also the place where the off-roading was to begin as we were now off the Manali-Leh highway. But frankly, judging by the horrid state of the Manali-Leh highway itself, it seemed like we had already done our fair share of off-roading for this ride. I’m not sure whether it was the altitude sickness that had kicked in, the back breaking ride of the last three days or the cold morning air, Guru and I found ourselves thinking, talking and moving in slow motion. We somehow managed to drag ourselves to get some breakfast, loaded our stuff into the Bolero and started riding towards Mahe at 9:30 am. The road started out as smooth tarmac and then eventually gave way to a dirt track. There were some stretches where the tarmac showed itself again, but the road was mainly a pile of rubble laid our in a somewhat straight line segments weaving between mountains. We made slow progress and finally reached the outskirts of Mahe by 12:30 pm. We had lunch, yet another bowl of Maggi noodles, at the army check post while we waited for the Bolero to catch up. 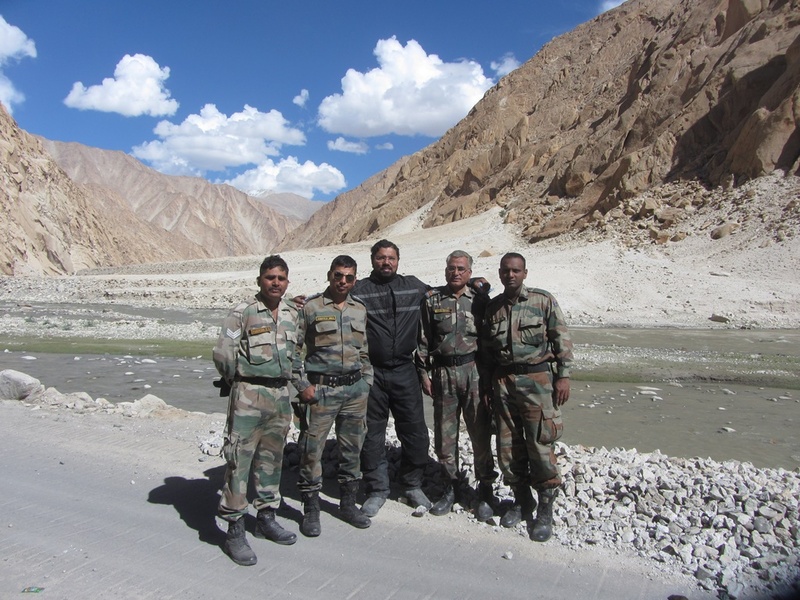 We needed to proceed as one group because we had a single pass for all three vehicles and this was a controlled area of Ladakh with a heavy army presence. We showed our pass to the army jawan and the man shook his head simply saying “no”. After seeing the WTF expression on our faces he proceeded to explain that our pass did not have the name Nyoma on it, which is why he couldn’t let us enter Mahe and proceed to Chushul, both of which fall under the Nyoma region of Ladakh. The pass was arranged by Hardev Motors, our back vehicle provider and I had specifically sent the detailed route, names of places and dates when we would be there. Obviously, somebody on their side screwed up and didn’t figure out that Nyoma should have been listed on the pass. We tried talking to the army jawan, but he wouldn’t budge. He explained that even if he let us through, there were more army check posts down the road and we would be stopped and turned back there. We had planned for such an eventuality. 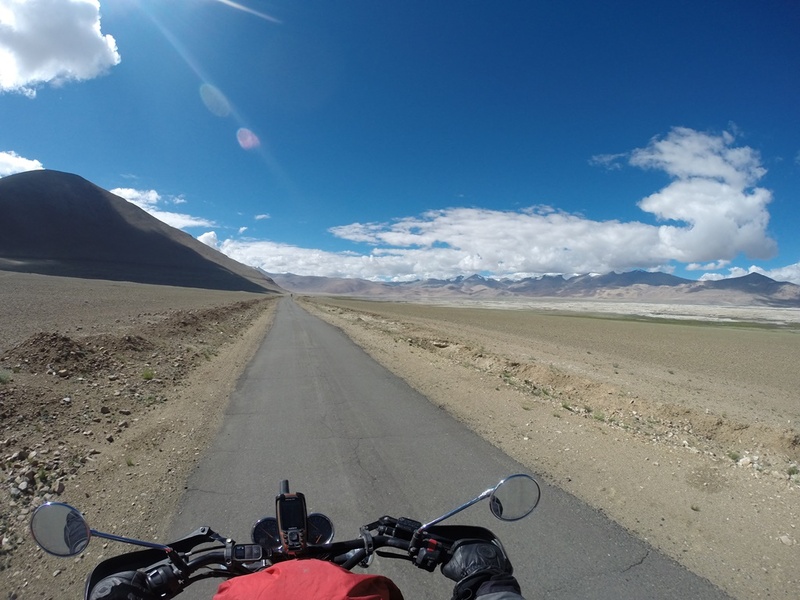 When Guru and I were planning this ride we realized that the Mahe and Chushul areas were sensitive due to Indo-Chinese military activity and there was a chance that we would be stopped or asked to go back at one of these places. So we moved to Plan B, which was to proceed north-west to Karu and then enter Pangong Tso from the north. So what was supposed to be a day of easy riding ended up being yet another day or riding hard and long. We started riding towards Upshi from Mahe. The road we took was almost parallel the the Manali-Leh highway but looked very different with mountains of orange rock instead of dark grey. Also there were a number of army bases on this road. I turned off and put away my helmet mounted GoPro camera and didn’t take pictures for most of the way due to the sensitivity of the area. Some thirty kms before Upshi we were asked to stop for a while as the Border Roads Organization was widening the road using heavy machinery. As we waited I caught up with a few army jawans and chatted with them. We finally reached Upshi at 4:30 pm and stopped for tea. 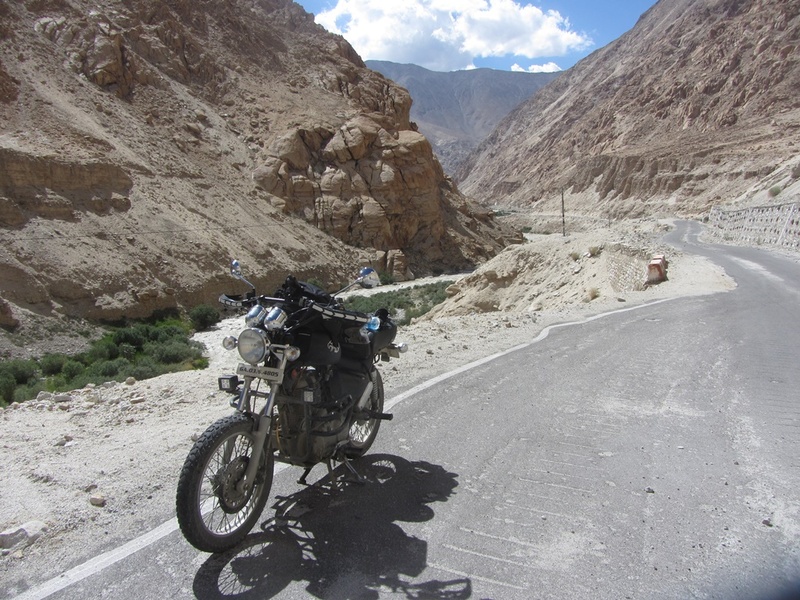 The plan was to stop for the night at Karu and then proceed to Pangong Tso the next morning. 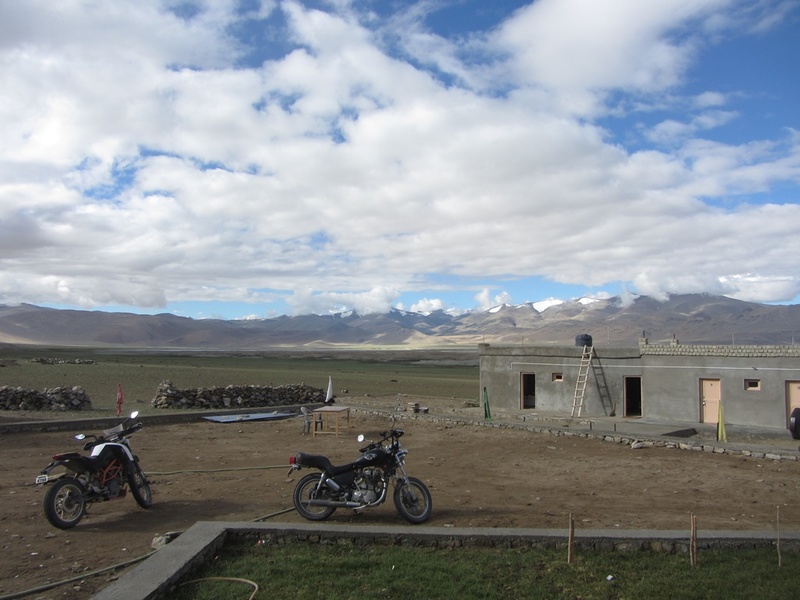 But Guru came up with the idea of riding another 30 minutes up to Leh where we had a chance of getting better accommodation than Karu. Also we had not eaten a proper meal in days and we decided to let ourselves loose in a nice restaurant in Leh. We checked into a hotel in Leh at 7:00 pm, had a shower and then proceeded to help ourselves to some nice food and alcohol in a proper restaurant. Here is a video of the day’s riding.